So as far as I'm concerned, this record came out in 2016, not 2015. 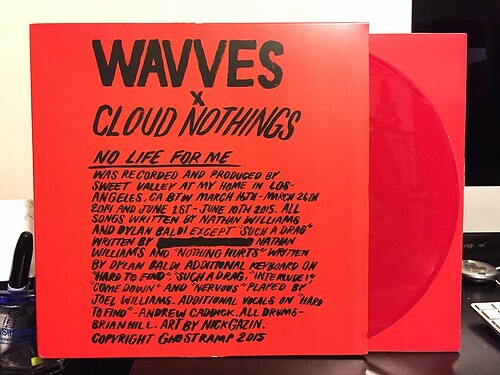 When first reading about this collaboration between Wavves and Cloud Nothings, I was pretty intrigued. I like Wavves and I really loved the last Cloud Nothings record, so this was sure to be good right? Well, it is good, but that's all it is. In pooling their talents, for some reason Wavves and Cloud Nothings sort of cancel each other out and this collaboration isn't nearly as good as either band on their own. In general they mostly sound like lesser Cloud Nothings throwaways. They don't have the oomph or the strong production that Cloud Nothings has and end up sounding a little murky. It's a short nine song record as is, plus two of the songs are just minute and a half instrumental noodling, so you really only get seven full songs. This record isn't bad and a couple of the songs are actually pretty good, but it ended up being a bit of a let down compared to what I know both bands are capable of.